This is the official webpage of the Paris Rebuild mod. thank you for this wonderful Paris. I love it. its a beautifulexpansion for ETS2. 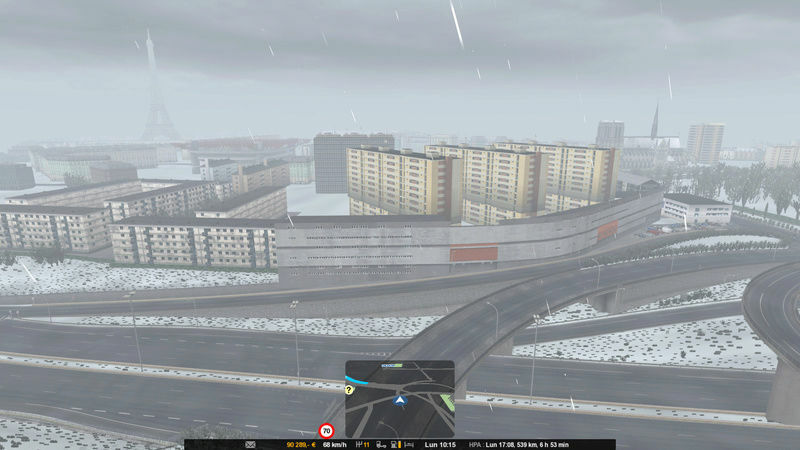 so the people who don`t use promods can keep using this mod. Thanks very much, look out for the new version at the weekend. So I should place this above ProMods n the mod manager? Looks Great!! Yes, place it above all other maps. Thank you for this wonderful work! I love it ! How can I check if my game has the France DLC? If it doesn’t, where can I get it? If you have the whole of France then you have the DLC, if not you can get it from Steam if you bought the game on there. Version 1.0 is working perfect. 2.0 and 2.1 are crashing the game to desktop. I`m using TSM, RusMap, ROS, Southern Region, EAA and NorthMap under Patch 1.27x. My loading order is OK. The only maps I can guarantee it works with are Promods, TSM and MHA, it should work with other maps that haven’t made changes to the Paris area but I can’t guarantee it. If you check the log file it should tell you what the problem is. Great job on this map, Grimes..Will you plan on connecting the A 4 autoroute and the A 13 autoroute so that we dont have to travel the entire ringroad just to leave Paris via autoroute? It seems like a easy connection to me.. Thanks mate, I’m not planning on updating this mod at the moment but maybe that’s something I’ll check out in the future. just got your paris rebuild it was so good keep up the good work…. It’s just around the corner from the football stadium and is visible from other areas. Que belo trabalho exposto Grimes, fico a imaginar o que virá em futuras atualizações deste grande trabalho. Thank you Lumia, I’m not planning to add any more roads at the moment, maybe in the future. Thanks Schumi, if I update it I will open that road..
Will be updated after 1.31 is officially released. Thanx, your job is really wonderfull, i’m really looking forward to have this new map ! Hopefully will be updated this week. Hi, you can add other roads around Paris for 1.31 ? 🙂 Great job i love your mods ! Thanks 🙂 There won’t be any new roads in the next update, maybe in the future. Doesn’t work for me on 1.31. Crash start drops me back to the loading screen. Will be updated to 1.31 soon. Thank you for the update !!! I have a problem with version 2.2 the previous versions worked perfectly, with 60 fps stable. But in this new version the FPS come down in a brutal way. Could it be due to increased traffic, or new textures? I can’t use it that way. But thank you, anyway. With the extra detail, traffic etc you might experience a small drop in FPS but it shouldn’t be brutal and it should still be perfectly playable, sometimes when you load in a map mod for the first time it plays a little slow but the rest of the time it’s fine, hut if more people report this kind of issue then maybe I will have to release a less detailed version. Yes… Thanks Grimes for the update! Thanks for update, very good job as usual !! Well, brutal might be a little overdone. The truth is that before I always had 60 fps. Now, few times. In some areas, as near the cathedral, it drops to 40. The problem is that any fps drop, even if it is small, is very noticeable. Still, it’s a very good map. Il ne manque plus que Rungis ! Je suis tout a faire d´accord. Rungis c´est une Marché important, mais aussi assez complexe. Je ne sais plus, comme bien Fois j´était la bas, livrer ou charger. C´est toujours un Aventure. Hi Mr G, quick question re Paris if I may – is it compatible with World of Trucks contracts at all please? To be honest I don’t know as I don’t use World of Trucks. I´m using Paris since his Beginning and until now there is not one Problem with any Map or WoT. So as it is “only” a Map, there are all Companies as usual, what means, you can take Jobs from WoT without any Doubt. Yo Mr G, off-topic I know … but your awesome German Cities map … is it no longer available? Unfortunately no, because of SCS’s rebuild of Germany 1.32 this mod is practically impossible to update. Bonjour. est ce qu’il aura une mise a jour pour la nouvelle version du jeux ETS2 1.32.14s et plus. La version actuelle fonctionne avec 1.32 mais je ne pense pas que je vais la mettre à jour, peut-être plus tard dans l’année. Yes it works on 1.33. I think SCS are using some of the models with new looks and/or variants in the Baltic DLC as the game is complaining about them being missing. I checked it out previously and I didn’t see any issues, I’ll check it out again. ETS2-Mod Paris Rebuild 2.3 unfortunately crashes repeatedly with ETS2 1.34/ProMods 2.33 (only those two mods loaded). Please, verify! Strange I don’t think the past few versions of Promods have had any changes other than updating to to 1.32,33 and 34, maybe post your game.log to pastebin.com and maybe I can see what the error is. Yes. I have all, PM2-33, Swedish Islands,ScandinaviaMod, Sardinia and Paris since a long Time and it works perfect. Everything well now. I just didn’t know that it takes such a long time for ets2 to compute the new navigation map (preventing multi-tasking and the task manager describing it as not responsive). Maybe it would be helpful to warn other users new to ets2 of this peculiar behavior. So, sorry for the false alarm and thanks for your kind help!